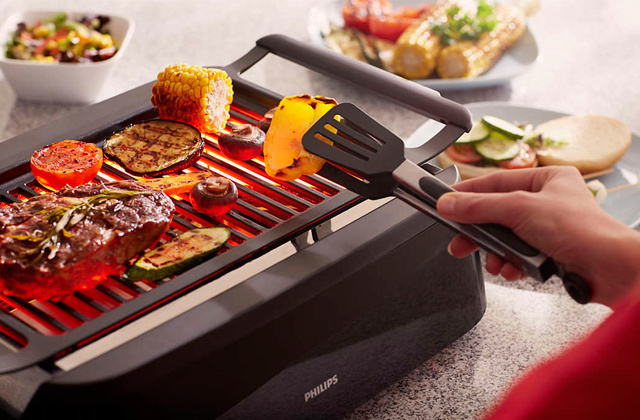 Owing to the floating hinge system the grill lid is automatically adjusted to accommodate even extra-thick steaks. The griddle's cooking surface is not so large. 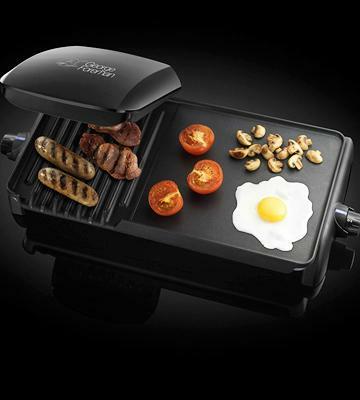 On purchasing this excellent electric griddle you will get a stand-alone device for preparing 2 different dishes simultaneously, thus fried eggs and grilled sausages will be ready all in a breath. 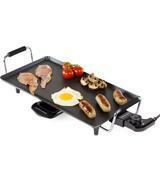 The electric griddle is designed with special location marks for error-proof assembling and added safety in use. The plastic housing is prone to scratching. The Wahl company has worked together with James Martin the seasoned Chef to design the best electric griddle with innovative technologies. You will definitely appreciate its high-quality and usability. You will highly appreciate the cooking surface made of cast iron that is known for its wear-resistance and high heating output. A bit tricky to remove a drip tray. 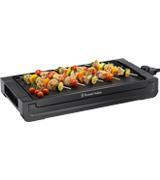 If you want to eat healthy food and improve your health, the Andrew James electric griddle will come in handy. 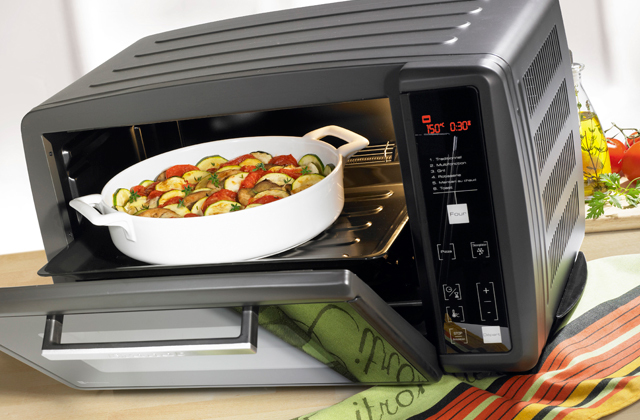 You will be able to fry any food you love with no oil at all. 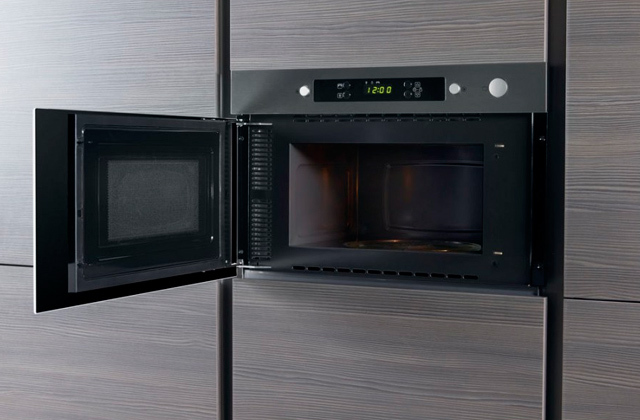 The large cooking surface of 1600 sq.cm allows you to prep a great number of portions at a time. The Teflon coating should be treated carefully. Want to add Japanese style to your party and surprise your friends with a variety of fried but healthy food? 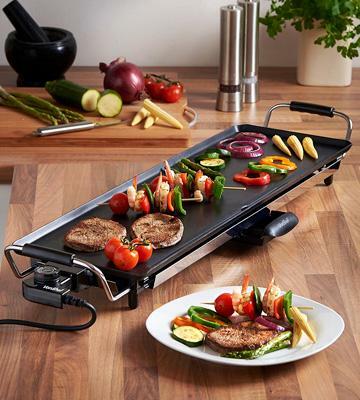 The multipurpose griddle from VonShef with XL large cooking surface will make your dream come true. The cooking surface and a drip tray are both removable and dishwasher-safe. The handles may run hot while you are cooking. 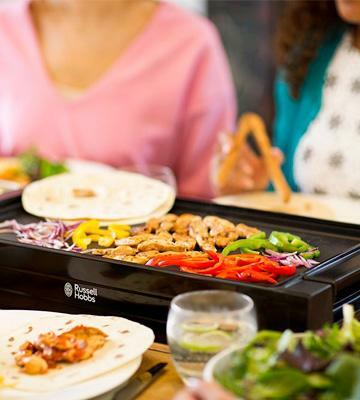 The Russell Hobbs electric griddle is the Aladdin's lamp for people who want to create fine cuisine without slaving over a hot stove. Go for the grill and see for yourself that cooking can be fast and trouble-free. Two Dishes at a Time? Sure Thing! 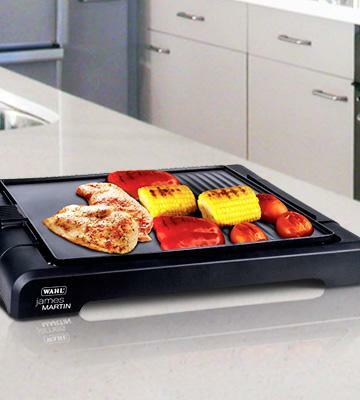 The George Foreman electric griddle is a multifunctional kitchen gadget with a unique and thought-out design that allows users to cook in it 2 different meals and in 2 different ways at a time. 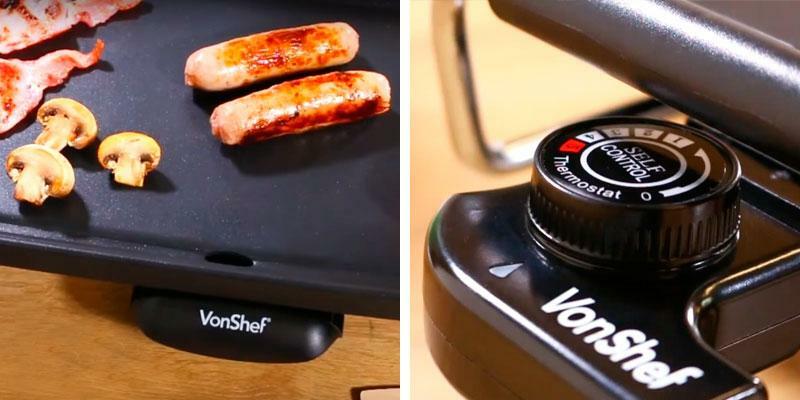 The dual cooking surface with a grill and a griddle will allow you to grill sausages on one side and fry eggs on the other one, saving you time and effort on cooking and cleaning. The cooking surface of the George Foreman electric griddle is pretty big and allows accommodating up to 10 portions. Quite impressive isn't it? Yet, there's more to come! 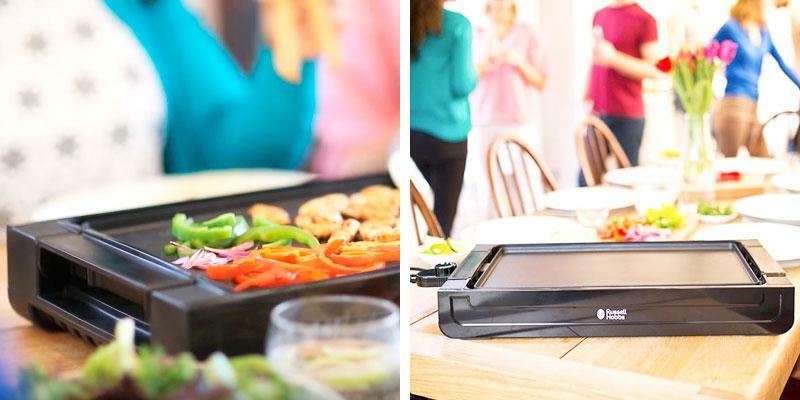 The George Foreman electric griddle combines the functionality of Panini Press, boasting the floating hinge system for making sandwiches, roasting steaks, frying bacon, etc. 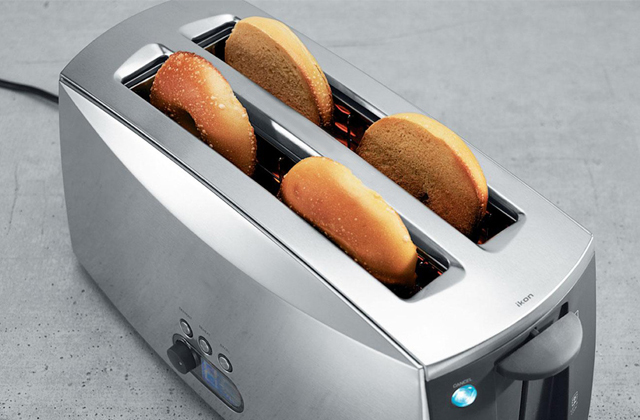 What you will surely appreciate about this griddle is the option to control the temperature of each of its surfaces separately by turning the knob. This feature is not only handy but also energy-efficient since you can have one surface on and the other one off. The heating time of both surfaces is quick due to the location of its heating elements - on top and at the bottom of the unit. If you are a smoked food lover and want to diverse your menu with savoury meals we recommend you to consider buying a charcoal smoker. 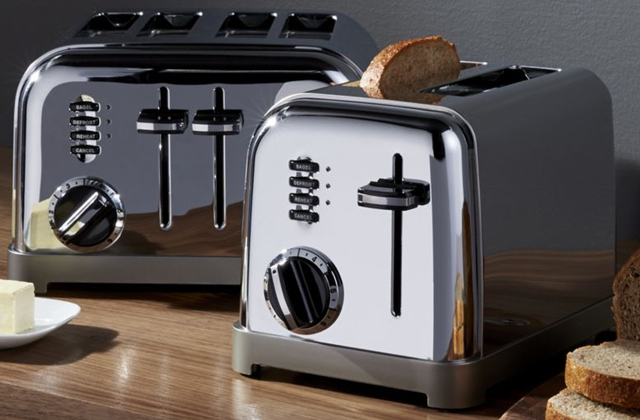 When buying a kitchen appliance, among the first things we consider is how easy it is to use it. In this sense, the ZX833 table top grill is hard to beat. Designed in collaboration with famous James Martin the seasoned Chef, this griddle stands out from the rest for its variety of useful features and simple maintenance. Let's take a look at some of its specs. 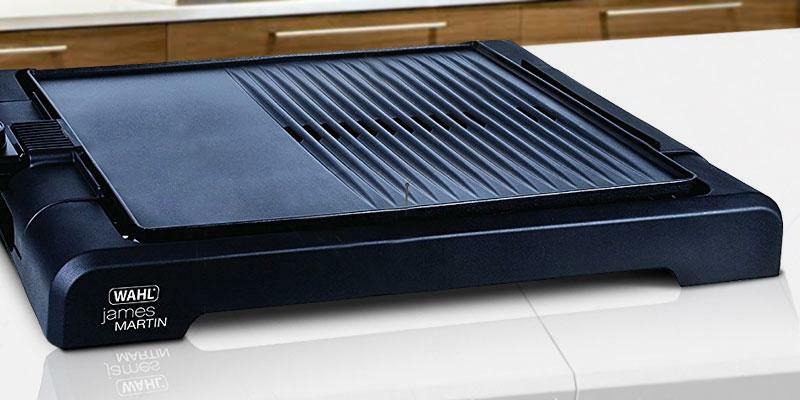 At 1500 Watts, the ZX833 griddle heats up in mere seconds and maintains the heat during the whole cooking process along the entire surface which makes 37x29 cm. Both a dip tray and a grill plate are removable for their easy access and clean-up. 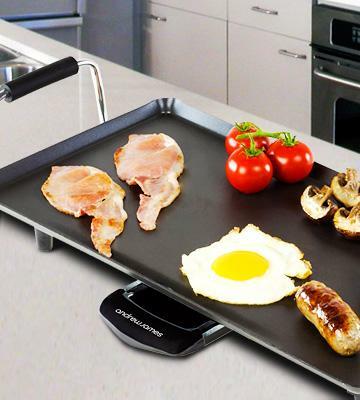 The griddle itself stands on non-skid feet that allows its stable operation on any cooking worktop. So, if you need a robust kitchen appliance with grooved and flat plates to grill and fry different food, you can easily opt for the ZX833 and be sure its performance won't disappoint you. To cook with pleasure, you'd need to have not only functional appliances but also decent cutlery. Make sure to read our review on Chef Knives and pick one to facilitate cutting and dicing jobs. If you cannot imagine your life without eating fried food, consider buying the Andrew James electric griddle and cook your favourite meals in a healthier way. 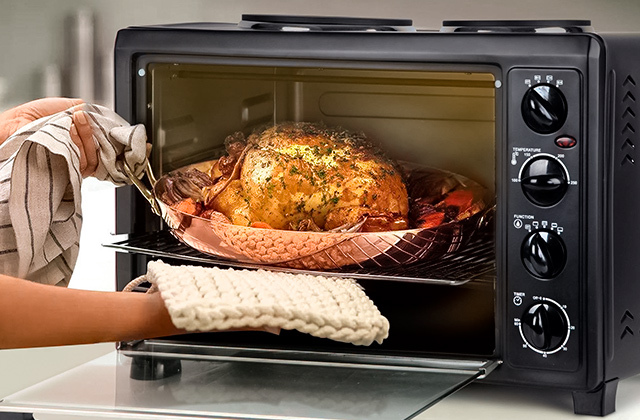 Due to the non-stick coating of the surface, there's no need to season it with oil at all. 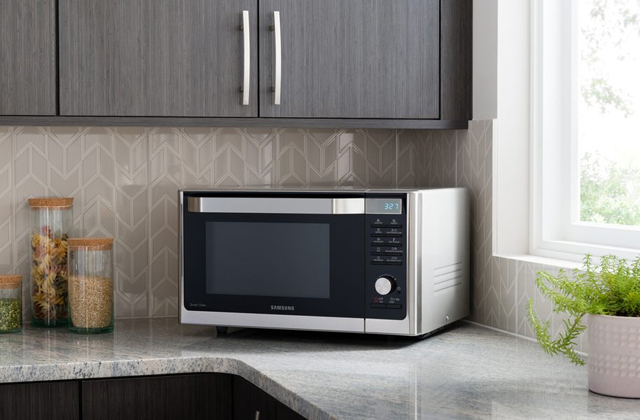 The grill has a thermostat with 5 settings, allowing users to pre-set and vary the temperature while the control lamp on the thermostat will tell you exactly when the plate has reached the set temperature. 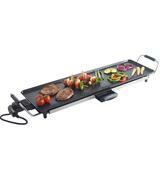 What we like about this griddle is that it can also be used for serving food, with a power cord being detached. With user's safety in mind, the griddle has been designed with cool-touch carrying handles and non-skid feet. The manufacturer recommends using wooden or silicon spatulas only, in order not to scratch the cooking surface and prolong the service life of the griddle. Cooking a juicy steak is half the job done. You need to offer your guests a convenient way to slice it. Why not get a set of steak knives for this purpose? The first thing that catches an eye is a huge cooking surface of the griddle (1600 sq.cm.) that allows cooking batches of food in one go. If you wanted to hold a party and invite over your friends, it would easily cope with this task. 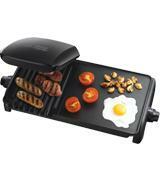 Owing to the whopping 2000 Watts power yield the griddle can quickly heat up and cook in a short while. The surface doesn't require oiling due to the aluminium Teflon coating being recognized for its unrivalled non-stick properties worldwide. The excess fat and grease that may appear during frying or roasting meat are collected in a removable drip tray, so you can be sure you're not going to eat extra calories and cholesterol. If you've been dreaming of a griddle but refused to buy it with a concern that it might clutter your worktop, forget these worries. The VonChef grill, in spite of its XL cooking surface, offers neat and compact storage thanks to its slim rectangular shape. There's absolutely no reason why you cannot store it away in a drawer! It's not much bigger than some regular oven plate. We also recommend you to look through our review on cookware sets that can make a cooking process much more enjoyable and comfortable for you. 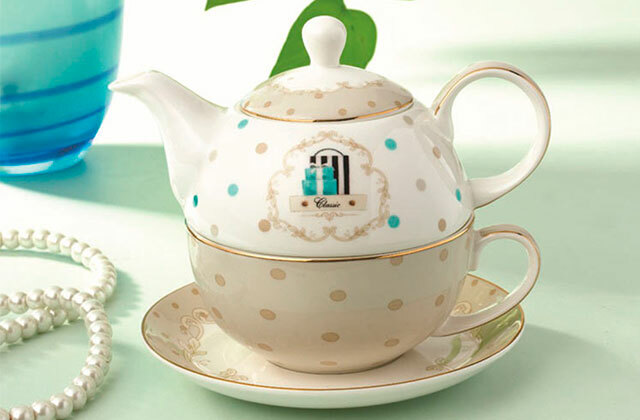 Would you like to treat your family with dainty dishes without slaving over a hot stove? The only option here is to use an electric griddle from Russell Hobbs. 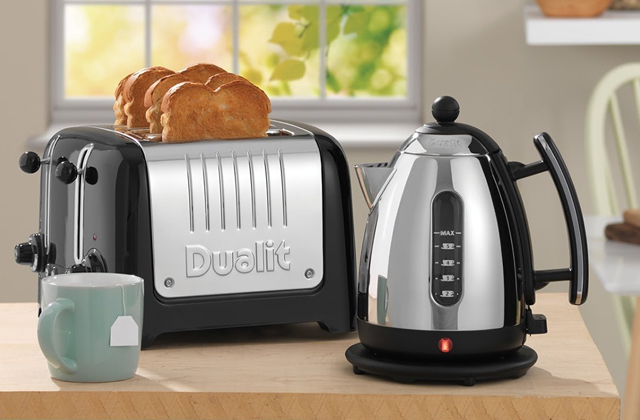 It is not only a saver of time while cooking but also a virtually maintenance-free device. 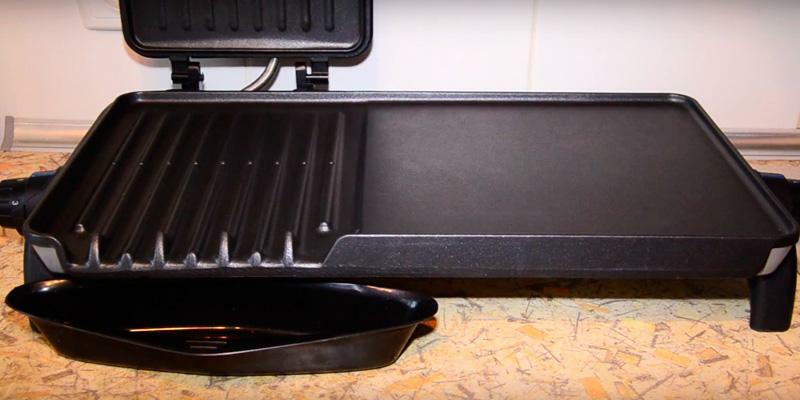 The griddle's housing is painted matte black that adds to the overall design of the griddle and makes it easy for cleaning. Just wipe the housing and cooking surface clean with a wet sponge or cloth and the griddle will be ready for the next use. Spend more time with your friends and less time on cleaning! The griddle boasts a fast heating time and adjustable thermostat allowing you to set the needed temperature for different food. We're more than convinced, once you try your first steak cooked in this griddle you'll never come back to cooking in a conventional oven. The reasons are obvious. Firstly, it takes less time on cooking; secondly, it drains away all excessive fat and grease from food; and thirdly, it doesn't need you to be around at all. Still hesitate? Don't. Cleaning is also simple and won't take you an effort. All you need to do is remove a drip tray and load it in a dishwasher, along with other dishes after your guests. That's it. 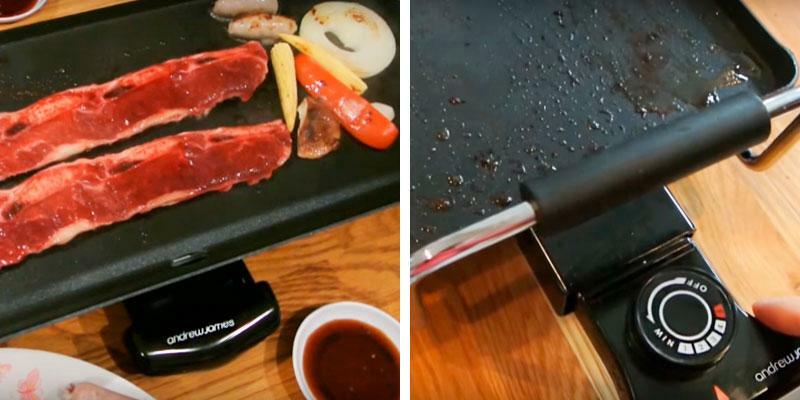 Electric griddle is a universal kitchen appliance used for cooking a variety of meals, starting from usual scrambled eggs and ending with some really exquisite dishes. What makes griddles an attractive option for customers is their compact size and overall simplicity. 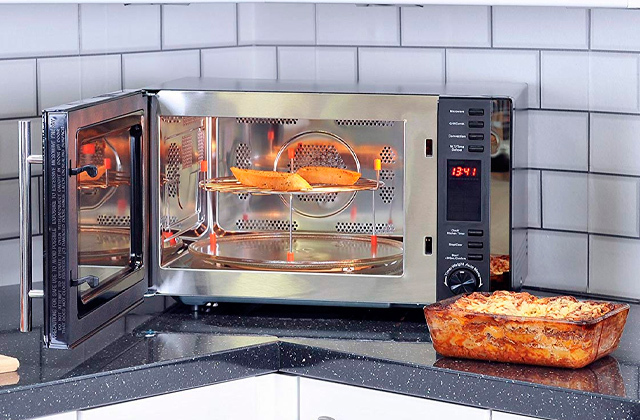 They generate less heat, consume less energy and take considerably less time for cooking than any of the traditional ovens. Electric griddles will become a great acquisition for those people who love to experiment with their menu and have rather small cooking worktops. The cooking abilities of griddles are truly vast. 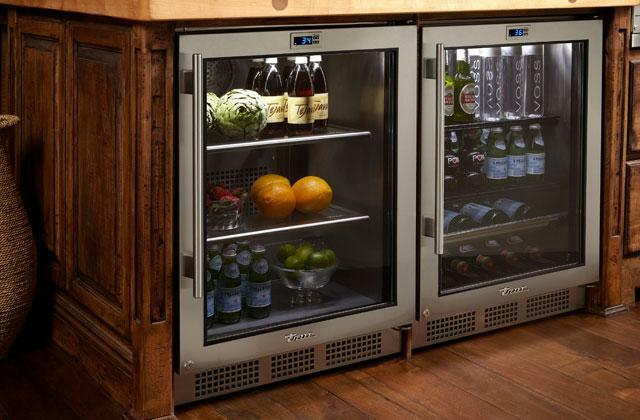 They are designed for cooking literally everything - meat, vegetables, hamburgers, steaks, cookies, biscuits and more. You can also take a look at our review of the electric skillets that can broaden your menu even more. In our review, we've gone through the most important criteria that one should take into account when selecting a skillet and presented only the best models from different brands. Choosing an electric griddle may become a chore, especially if you don’t know what to look for. Hopefully, our tips will help you make the right choice. First thing first, before you dig any further, consider the Cooking Surface of a chosen model. The bigger it is, the more food you’ll be able to accommodate on it. If you’re a family of two, there’s a very little chance that you’d want to get a really huge thing, but for a biggish family, the size of a cooking surface would surely matter. The other thing you should definitely pay attention to is whether a cooking surface has got a non-stick cover. 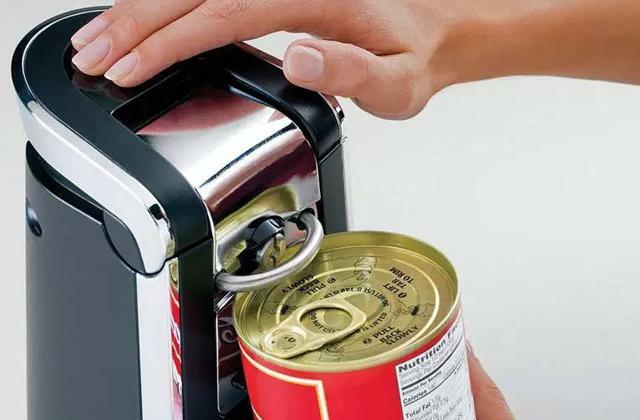 Not only is it convenient for use, but it is also essential for preservation of food taste. A cooking surface may also differ in functionality. More advanced griddles offer a few working areas with different heat distribution for cooking a few meals at one go. So, once you know what there is on offer, it will be way easier to decide what you need. Heating Options is the second characteristic that just cannot be ignored. It describes the temperature regimes supported by different devices. While the temperature amplitude may vary (depending on a model), you wouldn’t find a griddle hotter than 230°C and less warm than 120°C. However, for making a perfect meal on the griddle, you definitely need to know what temperature a certain dish should be maintained at. For example, to cook a roast, you would need to set a temperature around 200-210 degrees, to make a pizza - about 180 degrees, a traditional omelette would do well at a lower temperature - 120 degrees. So, the heat intensity is supposed to be regulated in order to give you more flexibility options while cooking. Power goes part and parcel with heating options. It’s not as an essential criterion as a temperature regime, though, but yet, it directly affects the heating rate of a griddle. 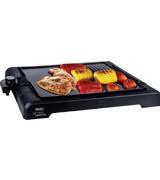 The distinguishing feature of an electric griddle over a traditional oven is its small size and compact construction. This is where you may want to consider such feature as Design and make sure that a chosen model totally meets your expectations. It’s got to be solid and durable. We’d also like to draw your attention to Cleaning and Ease of Use feature. For the fact that all ingredients are meant to be cooked right on the surface and not in a separate bowl, the cooking surface has got to be sticking-free and easily washable. You shouldn’t struggle with any bits and pieces deadly glued to the surface. The cleaning has got to be a breeze with no scrubbing involved. Some other important things to pay attention to are whether a griddle you’ve chosen is dishwasher safe and whether it is intuitive in operation. Hopefully, our review will help you find the model to fit all your needs. You wouldn’t want to buy a thing that would make you stagger. It’s got to both, easy to maintain and easy to clean. Some of the important things to pay attention to are whether a griddle you’ve chosen is dishwasher safe and whether it is intuitive in operation. Hopefully, our review will help you find the model to fit all your needs. 1. Lisa Maloney Electric Grill Buying Guide, ConsumerSearch. October 10, 2016. 2. Christine Gallary Why I Love My Electric Griddle, Kitchn. October 13, 2014. 3. 100 Greatest Cooking Tips (of all time! ), FoodNetwork. 4. Griddle, Wikipedia. January 16, 2017. 5. Your Guide to Buying an Indoor Grill, eBay. March 3, 2016.